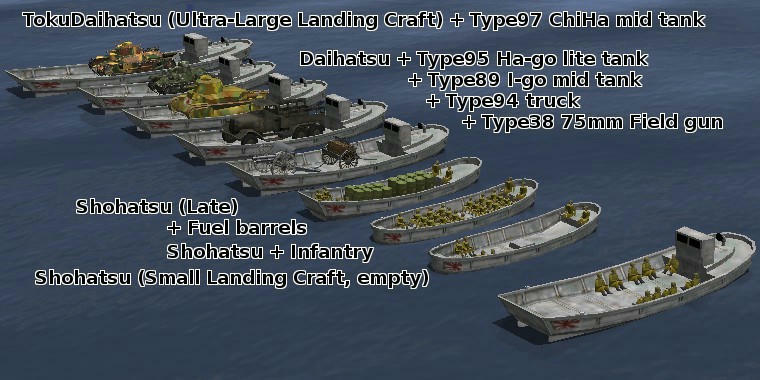 IL-2 1946 stock game has Japanese Army (IJA) Landing Craft Daihatsu. ( Dai "大" means Large , hatsu "発" is a abbreviation of Motor / Engine. Its stock model carries only a few infantry ..... not showing so urgent landing scenario. And historical Daihatsu's main purpose was carrying Tanks and Trucks / Artilleries , its bow ramp was designed for it. 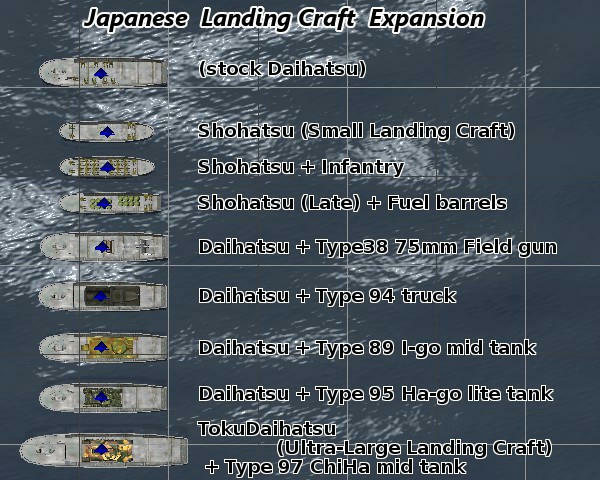 I attach 4x ground objects (stock or modded) on Daihatsu model. And I make Ultra-Large (特大) variant called TokuDaihatsu with Type97 ChiHa medium tank. Easy 3d stretching from stock model. 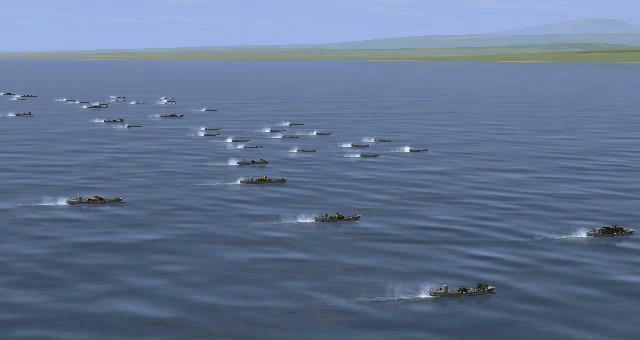 And I add Shohatsu (小発 , Small Landing Craft) + many infantry model. Original Shohatsu had a normal bow and a few Late model had a bow ramp like Daihatsu. I also make it with Fuel barrels. Nice addition. In some of my missions I have added objects like that on to the boat. Now it looks much better. I am especially interested in the boat carrying the barrels. I'd like to see a boat carrying boxes of supplies and ammunition as they were used at Guadalcanal and New Guinea. 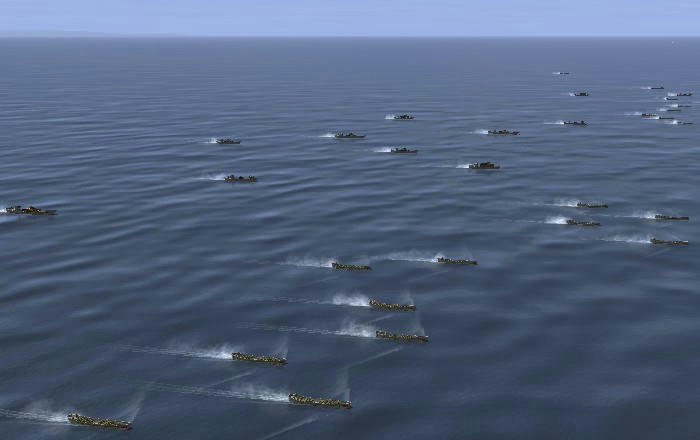 I imagine strafing a boat, having a huge explosion, and then watching it sink. Beautiful landing craft , I really like the new versions. Thank you very much Western ! This was a great idea and these vessels were needed. Western - Great , great addition ! or much more easily , a generic nondescript shape covered in a tarp ? This would be very useful for mission and campaign design , in my opinion. Awesome work Western! Thank you. Extremely useful addition! Many thanks for your work, Western! Your helps assist my modding everyday. 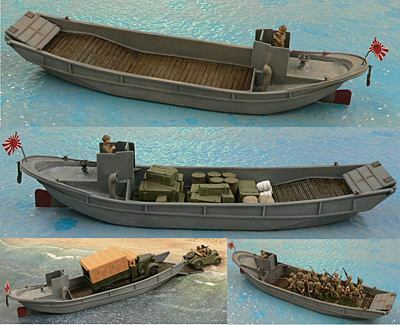 I'd like to see a boat carrying boxes of supplies and ammunition as they were used at Guadalcanal and New Guinea. I've wondered how about too many slots use for variations. v1.0 has limited variants, so. Adding cargo variations with individual slots are not so hard. In which style cargo fitting to Daihatsu / Shohatsu, do you think ? Wood box or covered in a tarp ? I search photos .... but almost no result. And .... so ..... how many slots to be added ? +2 or +3 ? more ?? In my opinion 1 would be enough. Something like this...the middle image...but maybe a bit more loaded up.